Next year, 924-passenger Braemar is set to break the world record for the longest ship ever to traverse the Corinth Canal in Greece as the ship embarks on a sold-out cruise around the stunning Greek Islands. Now Fred. 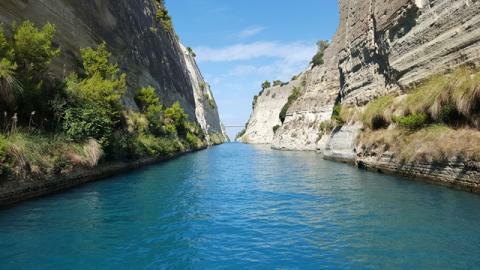 Olsen is offering guests a second chance to experience the momentous occasion by launching its second ‘Greek Islands & Corinth Canal’ sailing well in advance of its 2020/21 cruise programme being released. This exciting cruise will go on sale exclusively to the various levels of Fred. Olsen's loyalty scheme, Oceans, from 19th to 21st November 2018, before it is released onto general sale on 27th November 2018. “This is set to be such an exciting sailing in 2019 – and indeed a milestone in our history – and as such we knew that we wanted to give more of our guests the opportunity to experience it. “At Fred. Olsen, we strive to create memories that last a lifetime – and with guests aboard 196-metre Braemar set to be so close to the edges of the canal that they could almost touch the rock faces, we know it is a trip that will remain fondly in the memories of our guests. Braemar’s 25-night M2109 ‘Greek Islands & Corinth Canal’ cruise, ex Southampton, UK, on 16th April 2021. Prices start from £3,999 per person. The price shown is based on two adults sharing a twin-bedded Interior Room, and includes accommodation, all meals and entertainment, plus port taxes.